الرئيس الأمريكي دونالد #ترامب: سنبقي على قرابة 400 جندي أمريكي شمال شرق #سوريا. مواقع كردية: "قسد" (قوات سوريا الديمقراطية) تسيطر على قرية الباغوز الصغيرة بريف #دير_الزور الجنوبي الشرقي، بعد اشتباكات مع مسلحي داعش، فيما بقيت فلول داعش في محيط تل القرية. But do to the US idiotic policy & (clumsy) strategy (my article after tomorrow), #Washington can keep its forces as long as needed at al-Tanf. The #US is helping #Assad to be selective with the refugee return and he will certainly run the elections with or without refugees. #US is putting pressure on Arab countries to slow down their return to #Damascus & regain the diplomatic and the commercial relationship with #Syria. The US is occupying Tanf also to prevent the commerce between #Iraq and Syria and putting pressure on #Jordan for the same reason. the big question is where is the RAT BAGHDADI ? With cleaning operations near Baghuz cliff finished #SDF announced the end of #ISIS "Califate" after militants lost their last urban area. #CizireStorm offensive finished after 532 days of operations & 14020 Km^2 liberated Congratulations #Syria & Syrian people !! Israeli airstrikes...check the thread for more info. de22eli fawran la @LVV s2alo shou camarade Putin 3am ya3mol ! 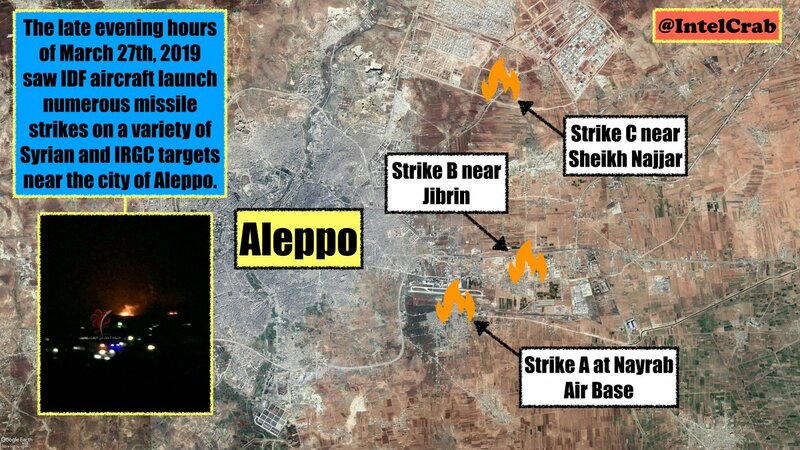 Custom infographic highlighting IDF airstrikes on IRGC/SAA installations near #Aleppo this evening. https://twitter.com/TomtheBasedCat/status/1111031495379030016 … Reports that 9 rockets were fired from outside of Syrian airspace and that half of them were intercepted by the air defenses. Army headquarters in Sheikh Najjar was targeted and another headquarters near Naqreen area. No casualties at the moment. What happened to S-1000 ?